The Dauphiné (/ˌdoʊfiːˈneɪ/ or /ˈdoʊfɪneɪ/; French pronunciation: [do.fi.ne]) or Dauphiné Viennois, formerly Dauphiny in English, is a former province in southeastern France, whose area roughly corresponded to that of the present departments of Isère, Drôme, and Hautes-Alpes. 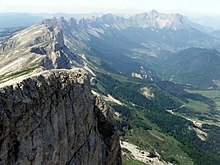 The Dauphiné was originally the County of Albon. In the 12th century, the local ruler Count Guigues IV of Albon (c.1095–1142) bore a dolphin on his coat of arms and was nicknamed le Dauphin (French for dolphin). His descendants changed their title from Count of Albon to Dauphin of Viennois. The state took the name of Dauphiné. It became a state of the Holy Roman Empire in the 11th century. The Dauphiné is best known for its transfer from the last non-royal Dauphin (who had great debts and no direct heir) to the King of France in 1349. The terms of the transfer stipulated that the heir apparent of France would henceforth be called "le Dauphin" and included significant autonomy and tax exemption for the Dauphiné region, most of which it retained only until 1457, though it remained a province until the French Revolution. 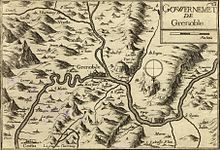 The historical capital is Grenoble and the other main towns are Vienne, Valence, Montélimar, Gap and Romans-sur-Isère. The demonym for its inhabitants is Dauphinois. Imperial suzerainty was not entirely forgotten in the 15th century. The Emperor Sigismund negotiated with King Henry V of England to give the Dauphiné to an English prince. The Dauphinois also did not forget their autonomy. The Pragmatic Sanction of Bourges (1438), which exposed Gallicanism, and the Concordat of Bologna (1516), which rectified France with the Papacy, were both promulgated for France and the Dauphiné distinctly. The Ordinance of Villers-Cotterêts (1539), on the other hand, which made French the official language of France, since it was not issued by the king as dauphin was not recognised in the Dauphiné. A second ordinance was promulgated at Abbeville on 9 April 1540 by the king as dauphin and this the Dauphinois parliament accepted. In 1787, the province was one of the first to demand the meeting of the Estates General of France. The turning point occurred in 1788 with the Day of the Tiles. The King ordered the expulsion of the parliamentarians from Grenoble. 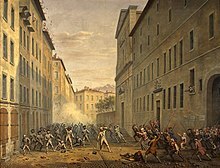 In part because the economy of the city was dependent on its Parliament, the local people attacked the royal troops by throwing tiles from rooves to prevent the expulsion of the magistrates. This event allowed the sitting of the Assembly of Vizille, which instigated the meeting of the old Estates General, thus beginning the Revolution. The approval of the establishment of the Empire was clear and overwhelming in the Dauphiné. In Isère, the results showed 82,084 yes and only 12 no. In World War II, during the Italian invasion of France, the Chasseurs Alpins contained the Italian troops, preventing an invasion of the region. But the German victories in northern France quickly threatened the troops in Dauphiné. The Nazis were stopped near Grenoble, at Voreppe. The French forces resisted until the armistice. The Dauphiné was then part of the French State, before being occupied by the Italians from 1942 to 1943, when the Germans occupied southern France. The various territories of Dauphiné experienced diverging demographic evolutions. The plains of Low Dauphiné and the large cities saw their population strongly increase during the 20th century (thanks to the industrial development and immigrant workers' arrival), while the mountainous regions of High-Dauphiné suffered from a pronounced exodus. Grenoble concentrates around a third of the population of Dauphiné, and Valence is now the second largest Dauphiné metropolis. Dauphiné also has a network of mid-sized cities covering all its territory (Vienne, Montélimar, Gap, etc.). The Dauphiné, or the Critérium du Dauphiné (formerly the [Critérium du] Dauphiné libéré, after the newspaper Le Dauphiné libéré that until 2010 had been sponsoring the event since its creation in 1947), is a multiple stage bicycle race. Amongst its winners one saw many of the most famous cyclists, e.g. : Louison Bobet, Henry Anglade, Jacques Anquetil, Raymond Poulidor, Luis Ocaña, Eddy Merckx, Bernard Thévenet, Bernard Hinault, Greg LeMond (by disqualification of the first arrived Pascal Simon), Phil Anderson, Luis Herrera, Charly Mottet, Miguel Indurain, Alexander Vinokourov, Tyler Hamilton, Alejandro Valverde, Bradley Wiggins and Chris Froome. Annually during a week in June, cycling fans in most European countries watch the prestigious road race in and around the Dauphiné area on live television. ^ "Dauphiné, divisé en trois départemens suivant le décrêt de l'assemblée nationale, sanctionné par le roi ; avec toutes les routes, et les distances en lieuës d'usage dans ces pays ;". Europeana. Retrieved 28 February 2012. ^ "Francefromages.com". Archived from the original on 18 April 2006. Retrieved 27 August 2009. ^ Jones, Jeff; Maloney, Tim (2004). "Pre-Tour showdown at the Dauphiné-Libéré". Cyclingnews Future Publishing Ltd. Retrieved 9 September 2015. ^ "History - Race winners since 1947". Critérium du Dauphiné. Official site. Archived from the original on 6 September 2015. Retrieved 9 September 2015. Wikimedia Commons has media related to Dauphiné. Dauphin of France, originally Dauphin of Viennois, was the title given to the heir apparent to the throne of France from 1350 to 1791 and 1824 to 1830. The word dauphin is French for dolphin. At first the heirs were granted the County of Viennois (Dauphiné) to rule, but eventually only the title was granted. 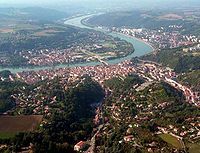 Faucigny(Italian: "Fossigni") is a commune in the Haute-Savoie department in the Auvergne-Rhône-Alpes region in south-eastern France. Briançon is a commune in the Hautes-Alpes department in the Provence-Alpes-Côte d'Azur region in southeastern France. It is a sub-prefecture of the department. Barraux is a commune in the Isère department in southeastern France. Guigues V was the Count of Albon and Grenoble from 1142 until his death. He was the first to take the title Dauphin du Viennois. Humbert I of Viennois was baron of la Tour-du-Pin and then also became, by his marriage, dauphin of Viennois. 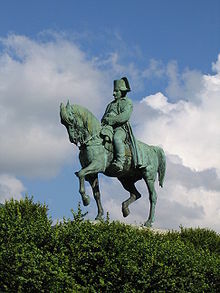 He was the son of Albert IV, baron of la Tour-du-Pin, and of Béatrice de Coligny. Guigues IV, called le Dauphin, was the count of Albon from 1133. He was the first to take the name Dauphin, meaning "dolphin", which became a title among his successors. The Collegiate Church of Saint-André, Grenoble is a parish church, formerly a collegiate church, dedicated to Saint Andrew, in Grenoble, France.